Episodic adventure game Life is Strange is one of very few videogames I have played from beginning to end more than once. Its committed decision-based gameplay fulfills the promise of interactive storytelling. It’s also a perfect time capsule of the early 2010’s, full of socially conscious meme-loving teens tentatively optimistic for the future. It stars photography student Max Caulfield and co-stars Chloe Price: a teenage girl with a penchant for misusing outdated slang, a wannabe gangster who drives while high and blackmails people. 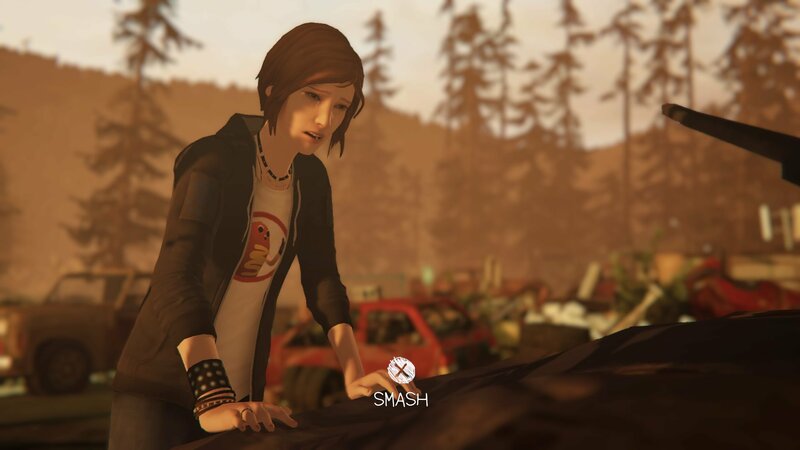 In a more mainstream game she might have been a minor character, a comic relief curiosity, but here we are in 2017 with prequel Before the Storm, and Chloe is the hero. Gone are the tilt-shifting and warm colours that belied the danger of Max’s world, emphasising the hopeless mindset of our new protagonist at this time in her life. In fact, the low-key atmosphere of the game is at odds with the vibrant graffiti style of the title and menus. Similarly, though Awake features another beautiful acoustic soundtrack brilliantly juxtaposed with the action, Chloe’s beloved punk music is surprisingly absent, replaced by grungier rock. Perhaps this is another way in which this Chloe will develop into the one we meet in the original. Don’t think Awake is a miserable experience though; in fact Chloe’s angst is responsible for the most exciting and hilarious feature of the game: ‘Backtalk.’ It’s a time sensitive challenge where you formulate comebacks based on specific phrases used by your opponent. It’s a better rap battle game than Def Jam. I appreciate the confidence with which this feature trusts the player to engage with the dialogue, and some of the vitriol that comes from Chloe’s mouth would make Max blush. In other ways, however, Chloe’s snark can grate. In cutscenes, hardly a line goes by without a retort, and not all of them land. The depth of conversations and how realistically the player engages with them is best explored in a game of ‘two truths and a lie,’ and a fantastic sequence involving a game of Dungeons and Dragons. Occasionally, however, I had the typical adventure game problem of dialogue options significantly differing from the actual dialogue they produced. It would be easy for Deck Nine to force the player’s hand and only offer the most acerbic choices to keep Chloe consistent, but the game is at its most powerful when it instead provides the player with the same reasons to act out that she has. I didn’t even want to engage in Backtalk with David, for example, until he called Chloe’s father’s death “a vacation from male authority.” I’m not letting him get away with that! It’s this kind of player engagement and emotional attachment that suggests that the complete Before the Storm could compare with the seminal original.